He has the passion, drive—and the commitment. Dominican music producer Krisha 'Dada' Lawrence is now a powerful creative force in regional music with catchy 'riddims' produced at his home-based studio in Canefield. Creating riddims is what Dada's is good at. His recent creation— the 'Loud Riddim' — has burst on the music scene in the region and beyond, becoming one of the most popular riddims requested by fans and artistes. Based on this success, Dada launched a follow-up riddim. The first song from the second segment, called the 'Loud 2 Riddim', was released in September. Dada noted that popular Trinidadian soca artiste, Flipo performed "Oh Gosh" with the Loud 1 Riddim and the song is doing well. Flipo is now working on a video of the song for the Trinidad carnival 2016. Having gained a niche in the Trinidadian music market, Dada is propelling his work in a 'soca' direction to take advantage of the massive publicity available in the twin-island republic. "We have a big dog in the race now…" he says with a laugh, adding that he is poised to make even bigger inroads in the music business. So far, both parts of the Loud Riddim was used in over 100 music-mixes in various parts of the world. Deejays overseas have used this riddim extensively on music videos posted on social media. "That means the work is really making some headway," he notes. Local artistes Janet Azzouz and Shalina, Canadian artiste Nia, as well as artistes from the BVI, St Lucia and Grenada are have been featured on the Loud 1 and 2 Riddims. Grenada has enthusiastically embraced the Loud Riddim and star deejay Private Ryan used parts one and two of the riddim for his 'hit-mixes'. "It's a huge boost for Dominica's music …it's a new kind of history for Dominica's music…" Dada says. 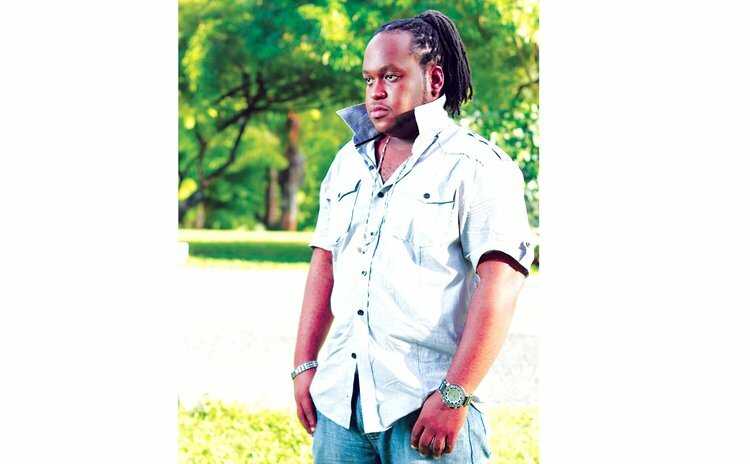 Fireman Hooper, St. Vincent's Soca Monarch, won on his title using Dada's 2014 'Madras Riddim'. That riddim featured Gramps Morgan of Morgan Heritage, Edwin Yearwood of Krosfyah, Luther of St. Vincent, Skinny Banton and Valene Nedd of Grenada, along with locals Hunter, Benz and Janet Azzouz. The Loud Riddim is a also a big hit in Grenada this year, featuring Valene Nedd's 'In my Dreams' and Skinny Banton's 'Ready to Chip'. Furthermore, 'Charlie Charlie' on the RX7 Rhythm was one of the biggest songs at St. Vincent's carnival this year, Dada said. Dada says his success came from tireless, devoted work in his studio — over five hours a day. "You must have a plan. It's more than just having a beat and people singing on it," he advises. Learning from each performance and making full use of new knowledge is essential, he adds. The producer said he is in a better position to create more hits because of the information that he has now, he says. Dada says that he spent a lot of time 'protecting' the sound of the Loud riddim and made sure the sound matched the top, professionally done riddims. Highlighting the importance of standards, Dada says featuring regional artistes helps to improve standards. While he has been producing more soca recently, Dada said he is versatile and well-equipped, with the know-how to produce any type of Dominican music. His productions have won the calypso monarch, road march monarch and junior monarch crowns in Dominica over the years. He says he also played a major role in creating a new style of bouyon for Triple-K in 2006. Further, in 2013, his production 'Long Tongue' won the Cadencelypso competition and was a major hit. Dada is concerned that Dominicans fail to take their own artistes and producers seriously. "Ever since the 70s, Dominica has failed to do that," he laments, adding that many genres have originated in Dominica, but have not been nurtured. He pointed to 'Cadencelypso', noting that the artistes had to sell this music in Guadeloupe. Guadeloupe also embraced Bouyon and is producing its own version, he says. "I have been around the region a few times working with artistes and bands…, they are not more talented than us. I believe Dominicans have a better vibe in playing music, a better style…"
He thinks that accomplished artistes have not been able to excel from within Dominica. Dada points out that the situation drives away talent, then the island pays exorbitant amounts for regional artistes to perform here. However, he still feels Dominica can do well in music. Producing high-quality music consistently is key, he says. Dada spoke of a producer/deejay in Guadeloupe. "From the time we reached in the driveway of his house all you can hear is Bouyon in his yard, everyday. "All he is doing is writing songs and recording songs all day, every day, all day, every day…"
He said in one month, Guadeloupe produces nearly 30 Bouyon songs. As such, he anticipates that the market for that music may shift from Dominica as people turn to Guadeloupe for Bouyon. "We need to start looking to develop our own thing, have some confidence in our thing…let us try to stop second-guessing our thing….no country is going to development our thing for us," he says. Dada notes that there are no recent success stories for Dominica in music. He added that there have been no billboard number ones in recent times and not even a billboard chart on the radio. Further, he does not think that artistes in Dominica treat music as a serious business and as a livelihood. "Dominica doesn't have a music industry. Dominica has music and people doing music. An industry involves artistes who look at music as a livelihood," he maintains.